Séverine qualified as a veterinarian from Liège University (Belgium) in 2007. 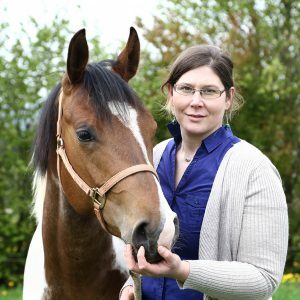 Since 2009, Séverine followed different post graduate trainings in veterinary osteopathy, acupuncture and physiotherapy as well as in equine dentistery. As a member of different Veterinarian Associations in Equine Veterinary Medicine (Equine section UPV – Veterinary Professional Union), Osteopathy (EVSO-European Veterinary Society for Osteopathy) and Natural Integrative Medicine (Altervet, created and chaired by Séverine since 2015). Séverine is committed to learn continuously in order to maintain a high level of competence and excellence in these fields. In 2018, Séverine created the Belgian School of Veterinary Osteopathy, Stillvet. By welcoming Séverine within the team, consultations in Natural Medicine can now be combined, if necessary, with consultations in Osteopathy and Internal Medicine, blood analysis, surgeries, dentistry or urgent care for horses. This is what Natural Integrative Medicine is about: putting our strengths together in order to offer your animal the best services.